The Concordia Stingers women’s basketball team went undefeated playing as the hosts of the annual Concordia-Reebok tournament at the Concordia Gymnasium from Dec. 28-30. The tournament consisted of four teams; two schools from Quebec and two schools from Ontario. The Stingers welcomed RSEQ rivals McGill Martlets, Canada’s number one ranked Windsor Lancers and number five ranked Carleton Ravens. Concordia won the tournament after beating Carleton 60-57 on Dec. 28 and Windsor 75-74 on Dec. 29. The Stingers’ victory over the Lancers was the first time Concordia has beat the country’s number one ranked team. In the first game of the tournament, Concordia and Carleton squared off. The Ravens, currently first place in the OUA East conference, have already defeated the Stingers this year in the pre-season. In the first quarter, both teams exchanged points until the final seconds. The visitors pulled ahead in the second quarter. Just a bit past the midway point of the quarter, Carleton had their biggest lead of the game, 13 points. The Stingers rallied back and brought the game to a four point difference at halftime. The Ravens led 35-31. 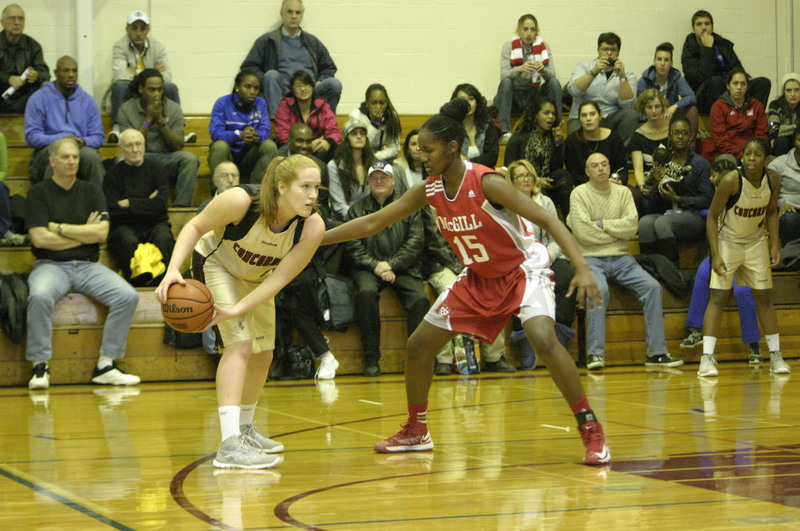 The Stingers were unable to make up any ground on Carleton in the third quarter. The Ravens jumped up to a 50-41 lead going into the final quarter. The fourth quarter was a different story for the maroon and gold. Two minutes into the quarter, ConU went on a nine-point scoring streak, tying the ball game up at 52-52 with 4:25 left to play. After a tense few final minutes, Concordia secured the victory with two free-throws in the last seconds to win 60-57. The following day, the Stingers were back at it, this time against the country’s top team, the Windsor Lancers. In the first quarter, the Lancers found themselves with an eight point lead halfway through. Concordia was able to bounce back and regain control of the game. In the second frame, the Stingers dictated the pace and had a 31-30 lead at the break. The Lancers would continue to push for the lead, but the Stingers stayed strong in the third quarter. In the final quarter of the game, the Lancers led as much as five points. ConU was resilient and quickly caught up. After four quarters, the score was tied at 67-67. Overtime was required to find a winner. In the nail-biting five minutes of overtime, Windsor had a two-point lead with 35 seconds remaining. After a Stingers timeout, Ashley Clarke missed her jumper with 13 seconds to play. ConU’s Tamara Pinard-Devos came up with a massive offensive rebound giving Clarke one last chance to win the game. With one second left, Clarke nailed a buzzer-beating three-pointer to give Concordia the 75-74 win. The Stingers are looking to use this strong tournament performance in their regular season games, which start up again this week with a game against McGill on Thursday and UQÀM on Saturday.